How did the Titans fall so quickly? Jeff Fisher is the longest-serving active NFL coach; 16 years at the helm, he has run the Oilers/Titans since before Bill Clinton met Monica Lewinsky. When 2009 began, Fisher was coming off a season in which he led Tennessee to a 13-3 record and home-field advantage throughout the playoffs. His seemed the most secure coaching position in football, except perhaps for Urban Meyer at the University of Florida and John Gagliardi at Saint John's of Minnesota. 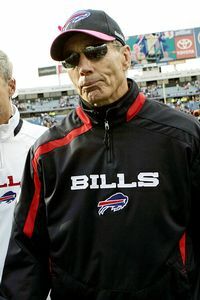 Now Fisher is likely to conclude 2009 fired -- if, that is, he makes it to the end of 2009 in a coach's cap. Godfrey Daniel, the Titans are awful. Their 59-0 defeat at New England -- the worst shutout defeat in professional football since the Rams beat the Falcons by the same margin in 1976 -- wasn't as close as the score indicated. In slush, snow and wind, New England fumbled once; Tennessee fumbled six times. The Flying Elvii threw 45 passes without an interception; the Flaming Thumbtacks threw 14 passes with two interceptions. New England showed four-wide formations and ran everything in its playbook; Tennessee mostly used a conventional "pro set" and only basic plays. Patriots receivers made difficult catches; Titans receivers dropped well-thrown balls. The Patriots ran blitzes and complex defensive stunts; the Titans were in a conventional defensive front all day. New England's touchdown passes went to Randy Moss and Wes Welker on downs in which they were not covered by anyone -- they simply ran up the field, ignored by all Tennessee defenders. On numerous snaps, Tennessee Pro Bowl safety Chris Hope and first-round-pick safety Michael Griffin barley bothered to jog in the general direction of the action. New England executed a perfect flea-flicker; Tennessee had trouble handing off. The Patriots gained 436 yards in the first half -- not in the game, in the first half. AP Photo/Winslow Townson Despite playing in camouflage, the Titans were unable to score a point. And don't talk to me about injuries -- all NFL teams deal with injuries. Seventh in overall defense last season, Tennessee is 31st now, and the Titans' minus-114 net points is just one better than league-worst St. Louis. Starting with that home-field playoff game on Jan. 10, Tennessee has lost seven straight games, and looked progressively worse each outing. Sports franchises sometimes go through meltdowns -- the City of Tampa Bucs are in the middle of a meltdown, while the St. Louis Rams and Kansas City Chiefs haven't been able to get their reactor cooling systems functioning since 2006. But the collapse of the Fisher-coached Titans -- built around power running and power defense, a purist's formula -- is a shock. The front office, the marketing department -- everything about the Titans has hummed efficiently for more than a decade. Suddenly the Titans rival the Rams and Bucs for the title of the league's worst team. Practically all NFL predictors had the Titans in the playoffs, if not in the Super Bowl. "Titans' Strength Lies in Stability of Coaching Staff" was a TMQ column headline a mere year ago. Godfrey Daniel, the Titans are awful. Manuel Cohen/Getty Images Centuries ago, the Mayans prophesied that the world would be destroyed by the Columbia Pictures division of Sony. 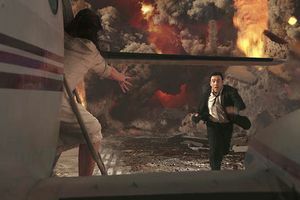 In cultural news, with the big-budget movie "2012" opening soon, Sony is avidly promoting how cool it would be if the entire Earth was destroyed. Why does a major corporation think this would be really cool? 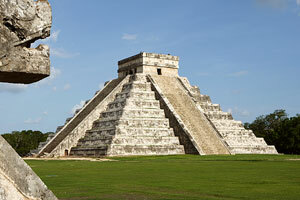 TMQ warned about the Mayan prophecies regarding December 2012 two years ago. The fact that there is now a major motion picture on this theme grants me peace of mind, owing to this rule of thumb: Anything predicted by a major Hollywood movie is certain not to happen. So what do I worry about? I worry about 01022010, and also about the Large Hadron Collider. See below. And in other football news, the NFL itself has reached the red zone. Will it score? See more below. Stats of the Week No. 1: Possession results for New Orleans in the first half against the No. 1-ranked Giants defense: touchdown, touchdown, touchdown, touchdown, turnover on downs at the Giants' 1, touchdown. Stats of the Week No. 2: Possession results for New England in the first half against Tennessee: missed field goal, touchdown, field goal, touchdown, touchdown, touchdown, touchdown, touchdown. Stats of the Week No. 3: Possession results for the Jets, in the second half and overtime against the Bills: interception, interception, interception, punt, interception, punt, interception. Columbia Pictures "Hurry! The entire premise is about to detonate!" Stats of the Week No. 4: In its past two games, the Buffalo defense has allowed a total of 118 passing yards, while making seven interceptions. Stats of the Week No. 5: Stretching back to last season, the Buccaneers have followed a 9-3 stretch with a 0-10 streak. Stats of the Week No. 6: Detroit has lost 18 straight games at Lambeau Field. Stats of the Week No. 7: The Redskins have played six consecutive games against teams that were winless entering each contest, and are 2-4. Stats of the Week No. 8: Seattle followed a 41-0 win with a 27-3 loss. Stats of the Week No. 9: New Orleans is on a pace to score 614 points this season. The NFL record, set by New England in 2007, is 589 points. Stats of the Week No. 10: Eddie Royal of Denver and Darren Sproles of San Diego combined for more kick-return yardage (461) Monday night than the total offensive yardage of either team. Arizona Cardinals Danielle hopes to work for ESPN. We won't shatter her illusions by revealing the Page 2 benefits package. Cheerleader of the Week: Danielle of the Arizona Cardinals, who is studying sports broadcasting and, according to her team bio, "hopes one day to make it to ESPN." She might be the perfect anchor for the new ESPN Extreme Sports Addict channel that will telecast SEC football practices, Scottish log throwing and intramural curling. Whoops -- I let slip a corporate secret. Sweet Plays of the Week: New Orleans went for it on fourth-and-1 from the Giants' 2-yard line, and got a touchdown. Later New Orleans went for it and fourth-and-goal from the Giants' 1-yard line and was stuffed -- but that's OK, the Giants fumbled two plays later! The Saints' 34-point first half against Jersey/A's league-leading defense was as good as an offensive display gets. Peyton Manning or Drew Brees, who's best right now? Hard to say, but Brees was 17-of-20 for 247 yards and three touchdowns and no interceptions in that first half, including a perfect 29-yard strike to Marques Colston when he was triple-covered. One 80-yard New Orleans touchdown drive consisted of all completions, with no rushes or failed passes. Brees spent most of the day under center, going against the recent shotgun-spread trend, and many of his completions weren't flashy calls, just perfectly executed slants and curls -- the kind of patterns New England used extensively in its scoring-record year. Slants and curls basically cannot be stopped so long as the passes are accurate and the blocking is good. New Orleans' offensive line for the game: Jermon Bushrod, Jahri Evans, Jonathan Goodwin, Carl Nicks and Jon Stinchcomb -- nary a first-round draft pick in the group. If you want to stop the Saints, try early -- New Orleans has scored on every opening drive this season. The only New Orleans criticism I can think of? A Saints interception return for a touchdown was nullified when linebacker Jonathan Vilma was called for roughing Eli Manning. Vilma hit Manning late, then leapt up and raised his arms in the "I didn't do anything" gesture. This is like requesting a flag! Football players should never make the "I didn't do anything" gesture, which only alerts the officials to the fact that you did something. Sweet Blocks of the Week No. 1: Rookie receiver Louis Murphy of Oakland got three downfield blocks on the 86-yard touchdown catch and run by Zach Miller. Murphy hustled the entire length of the field to block for Miller, pancaking one defender, then sprinting forward to find someone else to block. They coach 'em up right at the University of Florida. And thanks to that play, JaMarcus Russell now has two touchdown passes this season. Sweet Blocks of the Week No. 2: "One thousand one, one thousand two, one thousand three, one thousand four, one thousand five, one thousand six." That's what TMQ counted as Ben Roethlisberger scanned the field before throwing an 8-yard touchdown pass to Heath Miller. Cleveland rushed only three defenders, Pittsburgh sent five receivers out, and no defense can cover five receivers for six seconds, a long time in football terms. In the game, the Browns used kick-return star Josh Cribbs -- a TMQ favorite because he went undrafted -- as a Wildcat quarterback. Though Cribbs played quarterback in college, his first NFL pass clanged to the ground incomplete; his second was intercepted. That may be the end of Cribbs' Wildcat career. AP Photo/Chris O'Meara If only the team looked even half as good as the cheerleaders. Sour Play of the Week: With 1:36 remaining in Tampa, Bucs linebacker Adam Hayward made a routine tackle -- then he leapt up wildly celebrating, pounding himself on the chest as though his team had just won the Super Bowl. A few ticks of the clock later, Carolina scored the winning touchdown and the Bucs were 0-6. Let's save the wild celebrations until there is a victory in hand! Which, in City of Tampa's case, may take a while. The Panthers came into the game struggling on the ground, with an average of just 97 yards rushing per contest; Tampa allowed Carolina to run for 267 yards, in a game played on Tampa's home field. Jake Delhomme's accuracy problems have somehow slipped out of the sports news the past couple of weeks -- but Delhomme now has 15 interceptions in his past half-dozen games, and threw yet another pick-six on Sunday. Sour Team of the Week: OK, so Seattle has all kinds of offensive line injuries. But every NFL team must deal with injuries. Playing at home, the Green Men Group had only seven first downs, only 14 yards rushing, and only 114 yards passing -- against Arizona, which has the league's 31st-ranked pass defense. On the day, the Seahawks faced fourth-and-10, fourth-and-10, fourth-and-11, fourth-and-17, fourth-and-17 and fourth-and-31. Sweet 'N' Sour Play: With Minnesota leading 7-0 with the ball at the Baltimore 4-yard line, the Ravens blitzed seven and Brett Favre hit Bernard Berrian on the slant for a touchdown; that was sweet. Minnesota had two receivers right, and one left; Baltimore had only one safety, owing to the mega-blitz. The safety went to the left, where there was one receiver, rather than to the right, where there were two -- touchdown from the right slot. That was sour. Sweet 'N' Sour Set: With Chicago leading 7-0, Atlanta had a first-and-10 on the 40-yard line of the Ming Ding Xiong ("Bears whose outcomes are decided by fate"). The Falcons split Roddy White, Brian Finneran and Tony Gonzalez right. White came backward for a hitch-screen while Gonzalez and Finneran threw perfect blocks -- 40-yard touchdown. That was sweet. Chicago, seemingly surprised by a tight end split wide -- which was surprising a decade ago, but is now practically mandatory -- only sent two defenders to the "trips" side. That was sour. Later, Atlanta faced a third-and-goal on the Chicago 10-yard line with nine seconds remaining in the first half, and the Falcons holding a timeout. Atlanta showed "double slot," two split receivers on each side, with Gonzalez in the slot left; a running back went in motion right, to draw the defense that way; Gonzalez caught a pass for a touchdown. That was sweet. Once again, Chicago seemed surprised by a tight end split wide. Gonzalez was covered by middle linebacker Nick Roach; the Bears did not have a dime defense on the field, though it was totally obvious the pass would go to the end zone! (A short gain would accomplish nothing, since Atlanta would simply call its timeout and attempt a field goal.) That was sour. European Southern Observatory Barnard's Galaxy -- it's really small, only 10 million stars. A Cosmic Thought: Astronomers at the European Southern Observatory in Chile last week released stunning photos of Barnard's Galaxy, about 1.6 million light-years away, named for 19th-century stargazer E.E. Barnard. The bubble-like object in the upper left of the photo is a nebula fierce with hot-star formation. The cosmos is at least 14 billion years old, and not only are stars still forming, but nearby space is hot from the energy of young creation. 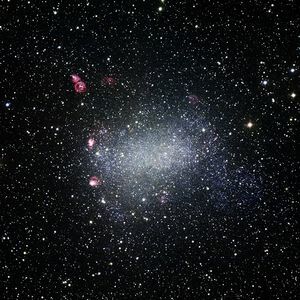 Barnard's Galaxy is called a "dwarf galaxy" because it is a fraction of the size of the Milky Way and contains "only" 10 million or so stars. By the way, researchers increasingly think our Milky Way -- once thought to contain a few thousand stars, then a few million, then 25 billion, and as recently as five years ago thought to contain 100 billion stars -- increasingly looks like it contains 400 billion stars. Or so. The NFL Is Also Like A Drug In Other Ways: The Red Zone Channel -- now on DirecTV, Comcast's digital sports tier, the Dish Network, and Verizon FIOS -- is a fabulous product. One hopes it will soon be available on all cable menus -- get cracking on this, Time Warner and Cox. Red Zone is a live highlights show happening while the Sunday afternoon contests are in progress, whipping the viewer around from game to game to catch most big plays and every touchdown. Production is well-managed -- when I am in my watch-all-games-simultaneously mode, Red Zone Channel almost always jumps to what I would jump to, and host Scott Hanson cracks decent jokes. RZC is in some ways Sunday Ticket Lite, teasing the viewer with a taste of what it would be like to be able to choose for yourself which game to watch. 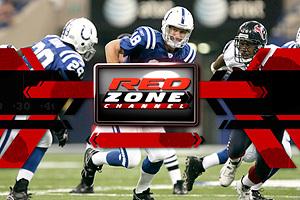 But Red Zone Channel also is a thing unto itself -- a different, comprehensive, fast-paced way to enjoy NFL football. It's the first really new idea in how to appreciate football since ESPN's highlights-oriented "NFL Primetime" debuted in 1987. (The 2006 NFL TV contracts reshuffle that brought "Monday Night Football" to ESPN ended the old format of "Primetime.") TMQ strongly recommends the Red Zone Channel. The Red Zone Channel raises some puzzling conundrums. First, it's a huge missed opportunity for Fox and CBS, the networks that broadcast Sunday daylight contests; and retroactively for NBC, back in the day when that network aired Sunday afternoon football. All of them had the opportunity to whip viewers around to highlights of other games, but rarely did so. Their conception of football broadcasting was that viewers want to focus exclusively on one contest, and don't care about other games in progress. Surely that's true of home-market games of winning teams -- say, when the Steelers are airing in western Pennsylvania. But what about everywhere else? For example, this Sunday, CBS stations in North Carolina aired the dreadful Kansas City at Washington contest, rather than the hot Baltimore at Minnesota game -- you can imagine how enthusiastic North Carolina viewers must have been about that. Reader Matt Mulry reports these are the games that aired in Greensboro, N.C., on Sunday afternoon: Chiefs at Redskins, Panthers at Bucs, Titans at Patriots. Combined records at kickoff, 7-22. It is hard to believe Piedmont viewers wanted to concentrate exclusively on such fare -- wouldn't fast-paced look-ins at other games be more enticing? Yet the regular networks failed to think of such an approach -- even though CBS had shown, with its March Madness coverage, that whipping around to whatever game is interesting makes for good television. DirecTV The NFL itself is in the red zone, will the league score? DirecTV gets credit for originating the Red Zone idea, which it developed from its Sunday Ticket package. Now the show is produced by the NFL Network, which essentially bought the concept in the latest round of TV negotiations. It's a positive sign about the NFL Network that the show keeps the let's-not-take-this-too-seriously sensibility Rich Eisen brought to that organization. The Red Zone Channel works better with a single host than having a large cast of former jocks and coaches like the networks use on their Sunday halftime shows. The large-cast format causes the focus to fall on letting each person make a comment about each topic. Hanson's focus is on the action. Right now, too few households get the Red Zone Channel to assess its ratings impact. My guess is that once the channel is widely seen, many football viewers will prefer it to what's on the regular NFC and AFC broadcasts -- especially when the local affiliate chooses to show some awful woofer and a hot game is in progress elsewhere. The Red Zone Channel is in effect a "workaround" to replace bad choices by local affiliates and the detested "secondary-market" games that NFL headquarters sometimes requires local affiliates to show, even when the games are woofers. It's an obvious irony that the NFL in many cases requires local affiliates to show terrible contests when strong pairings are available -- and now offers viewers an escape from its own broadcast impositions! If the Red Zone Channel catches on nationally, it seems inevitable that viewership for regular network Sunday daylight broadcasts will go down. Advertisers are not going to like that. Another great thing about the Red Zone Channel from the football lover's perspective is that it's commercial-free. Advertisers are not going to like that, either. The whole situation is a puzzle -- the NFL is promoting a commercial-free alternative to regular NFL viewing. Of course, this is not from the goodness of the league's heart -- the NFL receives a fee for every household that signs up for the NFL Network, and hopes enthusiasm for the fabulous Red Zone Channel will increase NFL Network penetration. It probably will, but perhaps at the expense of the value of CBS's and Fox's Sunday afternoon programming. To make things even more confusing, the NFL Network is running Red Zone Channel ads on the regular networks plus ESPN. The adverts don't make clear exactly what is going on with the product -- they are like those big-pharma ads that show a pill and scenes of happy multicultural people running through fields of wildflowers smiling, but never say what the drug is for. Big-pharma advertising like this is intended to cause you to call up your doctor and say, "I want that purple pill, and by the way, what does it do?" The NFL Network hopes people who can't get the Red Zone Channel will call their cable providers and demand the same. In this way, the NFL Network may realize its goal of expanding from limited distribution to universal access, of the kind enjoyed by ESPN and CNN. The irony here is doubly rich. For decades, the NFL has stridently opposed viewer choice by erecting barriers to the general availability of Sunday Ticket. Now that the league realizes it needs public opinion on its side in order to expand the NFL Network, suddenly the NFL supports a viewer-friendly, commercial-free special deal. "Monday Night Football" Analysis: When Darren Sproles was stuffed on third-and-goal on the Broncos' 2-yard line, forcing the Chargers to settle for a field goal and setting the tone for what would become yet another painful early-season loss, the announcers obsessed over the fact that LaDainian Tomlinson was out, and visibly sulking, on this key snap. What struck TMQ was that San Diego called the same play that failed in the same situation on the deciding down at the end of the Chargers-Ravens game! Left guard trap-pulls, and Sproles is supposed to go up the middle behind him. Against Baltimore, the down was fourth-and-2, and Ray Lewis smelled that play and stopped it. Here come the Bolts using the same action from the same distance with the same set -- same result. Not all players spend as much time in film study as they should, but absolutely everybody saw Ray Lewis stop this play on highlight shows! And Denver's defenders sure looked as if they knew what was coming. Eddie Royal was never touched on his 93-yard kickoff return touchdown or his 71-yard punt return touchdown. Obviously, that's good blocking. It's pretty fun to run the length of the field twice for touchdowns on national television if everyone in front of you has already been knocked to the ground. 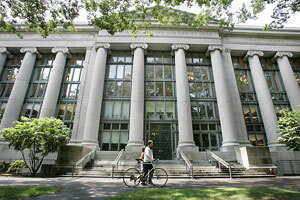 AP Photo/Charles Krupa Harvard University, where Ryan Fitzpatrick learned to handle a Rex Ryan blitz. San Diego is off to its traditional slow start -- must be something about beach weather in Southern California, because the Bolts just refuse to come to play until Armistice Day. Get your tickets now, I suppose, for San Diego's traditional furious December comeback. Meanwhile the Broncos are 6-0, and while their schedule gets tougher as the season progresses, Denver is positioned for good things. Kyle Orton, constantly looked down upon as merely a "game manager" and not a true quarterback, is now 27-12 as a starter -- a lot better performance than many cannon-armed quarterbacks one could name. Surely Orton cannot throw a 60-yard pass while kneeling, as JaMarcus Russell famously did. All Orton does is win games. The season is young, but it could turn out that unloading the always-complaining Jay Cutler for Orton and a bundle of high draft choices will be seen as a brilliant move by Denver. Hidden Play of the Week: Hidden plays are ones that never make highlight reels, but stop or sustain drives. Jersey/B leading 13-6 in the fourth quarter, the Jets intercepted Harvard graduate Ryan Fitzpatrick in Buffalo. But Lito Sheppard was called for illegal contact; Bills first down. Four snaps later, Fitzpatrick threw a touchdown strike to Lee Evans, and they were hoisting their sherry glasses in toasts in Cambridge. Fight fiercely, Harvard! AP Photo/Mike Groll How long until it's cheerio to "Cheerio, Chaps"? How does a team rush for 318 yards at home and lose? Try throwing six interceptions, five by glam-boy rookie Mark Sanchez and one by the holder after a botched field goal attempt. Why did the Jets keep throwing when they were rushing well, for an average of 8 yards per carry? In the fourth quarter and overtime, Jersey/B coaches called 13 rushes and 11 passing plays, the latter resulting in two interceptions (not counting the holder's interception) and a sack. Buffalo for its part once again was ultra-timid on offense. Attaining a first-and-10 on the Jets' 26 with 39 seconds remaining in regulation and holding a timeout, facing a stiff wind, the Bills did not hustle to run a couple of plays and improve their kicking position. Rather, they deliberately let the clock run down, staged a listless dive, deliberately let the clock run down, then called timeout with four seconds left. This did create a kick to win, but the kicker missed from 46 yards, as was likely, given the wind. In 2008, Buffalo was in almost exactly the same situation on "Monday Night Football" against Cleveland -- positioned for a long field goal attempt at the end, with time left to improve the position, but the Bills simply let the clock run down then missed a long field goal. Maybe the Bills should fire their offensive coordinator. No, wait, they already did. Combined record of the teams that fired their offensive coordinators on the eve of the season (Bills, Bucs and Chiefs): 3-15. We're All Professionals Here: The Jets and Bills combined for seven interceptions and 22 penalties and went 0-for-4 in the red zone. AP Photo/Steve Cannon "We did it! We beat a winless team in overtime!" Fortune Favors the Bold! Game scoreless, Houston went for it on fourth-and-1 at the Cincinnati 13, despite a prominent fourth-and-1 failure the previous Sunday. The Texans scored a touchdown on the possession, and the aggressive call set the tone for Houston's win. Carolina and Pittsburgh won after going for it on fourth-and-short situations in which most NFL coaches would kick. TMQ even liked Detroit going for it on fourth-and-1 when trailing Green Bay by 14-0. Though the attempt failed, and the lowly Lions were pounded, aggressive tactics eventually will reverse Detroit's losing psychology. Boldness bonus: After opening the game with a 15-play touchdown drive, which lasted 10:42, Arizona tried the "bloop onside," a deep onside kickoff. The Cardinals recovered and scored again; Arizona led 14-0 before Seattle had its first snap. 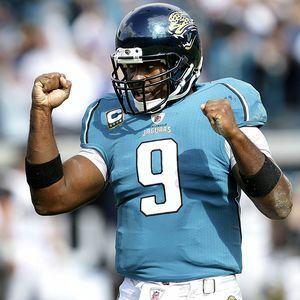 Buck-Buck-Brawckkkkkkk: Trailing by three, Les Mouflons were at the Jacksonville 9 with seven seconds remaining in regulation, and launched a field goal to force overtime: St. Louis never touched the ball in the fifth quarter; Jax won the coin toss and scored on the opening possession. Sure, a try for victory from the 9 might have failed -- though since St. Louis still had a timeout, the Rams might have run two plays. Anyway, St. Louis came into the contest 0-5 and on a 5-31 stretch. This team needs to reverse its losing psychology: Here was a chance for a signature moment that begins a turnaround. Now St. Louis is 0-6 and on a 5-32 stretch. Win McNamee/Getty Images "We did it! We're mathematically alive to finish 2-14!" Best Crowd Response: Spectators were streaming for the exits at FedEx Field with four minutes remaining, though the Redskins trailed only by a field goal and had just gotten the ball. Spectators were right about what would happen next. Every team is winless on Opening Day; the Skins' streak of facing those teams that remain winless is epic. In 2009, Washington has faced six consecutive teams that were winless entering each contest, and is only 2-4. The Redskins have a losing record against opponents who are a combined 9-26. Now, Jim "Dan Snyder Hasn't Fired Me Quite Just Yet" Zorn finds his play-calling authority removed by the team's general manager, and handed to a "consultant" (that's what the Redskins are calling him!) the GM just hired. In what sense are you head coach if the front office tells you that you're not allowed to call plays? Redskins management is likely to discover that staging a coup against its own coach will not improve team spirit, nor are there magical uncalled plays which will now be called. Zorn should have said, "If you want to fire me, then fire me; I will not accept an impossible position." 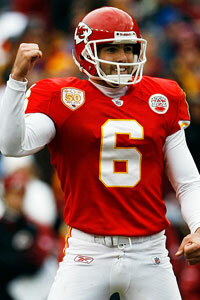 Meanwhile, Kansas City coach Todd Haley got a bucket of Gatorade dumped on his head for a win that made the Chiefs 1-5. If the Chiefs reach 2-5, perhaps Haley will float on a cloud directly to heaven. Rogue Planet? Cosmic Energy Wave? Palindrome Is Real Threat of Doom: Tuesday Morning Quarterback thinks the milestone you should worry about is not the year 2012 but the day Jan. 2, 2010 -- 01022010, a palindrome. The most recent palindrome day was Oct. 2, 2001 -- 10022001, and things were pretty crummy then, 9/11 having just occurred. The prior palindrome date was August 31, 1380 -- 08311380, and the entire 14th century was fairly crummy. (Historian Barbara Tuchman's great book "A Distant Mirror" basically concerns how crummy the 14th century was.) On the last palindrome date, in 2001, TMQ reader Tim Lowell predicted that first contact with space aliens will occur on Jan. 2, 2010. Since first contact with space aliens seems a lot more likely than an aircraft carrier being hurled into the White House -- this happens in the movie, though the White House is 100 miles from the ocean -- I am bracing for Jan. 2, 2010. AP Photo/Keith Srakocic One may land in Times Square on 01022010. Has anyone given thought to how society will respond to the first contact? So far, the galaxy appears silent -- SETI searches have neither heard nor seen any artificial signal or activity anywhere in the Milky Way. But the galaxy is huge, only a tiny fraction of its expanse has been scanned, and then only superficially. Intelligent life elsewhere seems probable, though it's impossible to know if space aliens would care about contacting other civilizations. 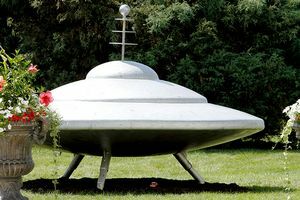 If, as now appears, there is no way to exceed the speed of light, first contact is more likely to come in the form of a complex message than a silver saucer hovering over the United Nations building. Of course, an invasion fleet could arrive, but since the galaxy contains essentially infinite resources, most available without resistance on unpopulated planets, it's not clear why an advanced species would bother invading another world. Then again, space aliens might have concerns entirely strange to us, or simply act irrationally, as many Earth governments have. Think of how first contact -- even peaceful contact -- with another intelligent species would disrupt life. Religions, brace yourselves: If space aliens either say "X religion is the true one" or alternatively "God is a superstition, we will give you the proof of that," either way there will be a sociological earthquake. Even if space aliens do not contact us until they have studied our languages -- aliens actually might speak perfect English, just like on "Star Trek" -- we may still have no idea what they are talking about, simply because their societies and ways of thinking will be so different. Euros Spare No Expenses to End World: Maybe the world will end if the Large Hadron Collider on the France-Switzerland border ever reaches full power. Fortunately, this is unlikely, considering how unreliable this $10 billion monstrosity is. Last year's attempt to start the device caused general chaos when 9,000 amps arced from a malfunctioning circuit, burning out superconducting fluids and knocking 35-ton magnets from their moorings. Just like in a sci-fi movie. (I hope someone got to shout into a com link, "We've got a Code Omega in Sector 45!") Now CERN, the European physics agency, says it plans to start beaming subatomic particles through the accelerator tunnels in November; there is no timetable for full power, which would simulate the subatomic energies that existed at the moment of the Big Bang. Surely that's perfectly safe! mediaarchive.cern.ch Gigantic machine to simulate the conditions of the Big Bang -- surely that's safe. For added safety, the machine is run by European bureaucrats. 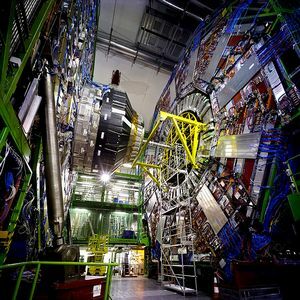 As TMQ noted two years ago, advanced particle accelerators such as the LHC exist mainly as employment programs for contractors and physicists -- yes, of course they may make a significant discovery -- while engaging a small but real risk of calamity. The LHC could create tiny black holes or a hyperdense "strangelet" particle that would crush the Earth out of existence. These outcomes are unlikely, but why risk calamity in order to spend $10 billion on a scientific plaything when the odds are 1,000-to-1 it will ever produce knowledge with practical value? Plus there's pressure for the United States to build a $10 billion competitor to the LHC -- we can't let France get credit for inadvertently crushing the Earth! -- which would be still more waste. Recently, Holger Nielsen and Masao Ninomiya, two physicists, proposed that the LHC refuses to work because subatomic particles from the future are coming backward in time to interfere with the gigantic device. In quantum physics, "entangled" particles seem to know each other's locations in space and time, and to interact simultaneously, without any known exchange of forces. The LHC is intended to generate a "Higgs boson," a hypothesized increment of creation from which all matter is hypothesized to arise; Nielsen and Ninomiya speculate that the LHC does generate a Higgs boson in the future, and the particle is now entangled with the present device, preventing it from functioning. All time-travel ideas create nonsensical paradoxes. In this case, if the Higgs boson made by the LHC in the future comes backward in time to prevent the LHC from working, then there won't be a Higgs boson generated in the future, so it can't come backward in time, thus the device should work. ABC "I am really scared -- I glimpsed the future of the show's ratings." "Entangled" particles from the future were the plot device of the 1999 science-fiction novel "Flashforward," on which the current television show is extremely loosely based. In the novel, Earth passes through a wave of particles that are entangled with future particles, allowing everyone a two-minute glimpse of his or her future. 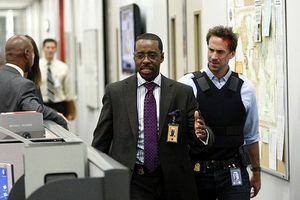 The TV show shares mainly the title: The show is "Heroes" meets "Lost," with the atmospherics of "Fringe" (sinister shadowy figure from another dimension is masterminding events). The novel builds up to a series of entangled-particle waves that allow people to see further and further into the future, but gradually most people stop having visions, because further in the future, they'll be dead -- except for the handful who are becoming immortal, and thus keep seeing further into the future. This makes about as much sense as Higgs bosons from the future messing up the Large Hadron Collider today. As long as time-traveling future particles keep the LHC from reaching full power and swallowing up the Alps, that's fine with me. Tactics Matter: As noted by reader Kevin Lasota of Rochester, N.Y., Oakland came into Sunday with the NFL's second-worst rush defense statistically; yet taking into account sacks and scrambles, Philadelphia coaches called 54 passes and 12 rushes. The Eagles never trailed by more than seven, so this wasn't owing to big-deficit desperation. Why barely even try to rush against a weak rush defense? In addition to coming down to the final snap, the Baltimore at Minnesota contest was fascinating in tactical terms, both for smart tactics and tactical errors. It was smart to run "underneath" the Vikings' Jared Allen. A defensive end who always plays for sacks, as Allen does, can take himself out of a rushing play by sprinting up the field and then being pushed farther up the field by the offensive tackle. That's what rookie left tackle Michael Oher did to Allen on Ray Rice's 33-yard touchdown run, which put Baltimore ahead 31-30 with 3:44 remaining: Allen sprinted up the field, Oher pushed him the way Allen wanted to go, then when Allen realized the play was planned to go "underneath" to the very spot he just vacated, Allen simply came to a halt and watched, making no attempt to chase. Chris Chester of Baltimore had an excellent pull block in the hole Allen vacated. Rice's earlier 22-yard touchdown came on the same action against Allen -- who did not adjust, and just kept sprinting up the field hoping to pad his sack stats. Minnesota leading 14-0 with 12 seconds remaining in the first half, Baltimore on the Vikings' 12, Joe Flacco threw a short checkdown pass to his tailback in the center of the field; the Nevermores then called timeout and kicked a field goal. With that little time left, and already in close field goal range, the pass must go into the end zone: Flacco's mental mistake cost the Ravens a possible four points in a game ultimately lost by two points. Now it's Baltimore 31, Minnesota 30 with the Vikings reaching first-and-10 on the Baltimore 18 with 2:51 remaining and both teams holding two timeouts. Minnesota went to conservative runs up the middle, content to accept a field goal. But that meant Baltimore would have one more chance -- and using its two timeouts and the two-minute warning, the Ravens got the ball back at 1:49, needing only a field goal to win. As Minnesota ran into the line, content to settle for a field goal, the home crowd booed loudly, and the home crowd was right! Baltimore missed its 44-yard attempt on the final snap -- only good luck bailed out the Vikings' suspect tactics. 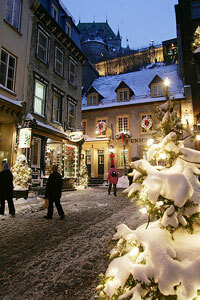 AP Photo/Jacques Boissinot Canada -- sinister secret headquarters of the Christmas Creep conspiracy? Christmas Creep: Kris Kelso of Nashville, Tenn., writes, "On Sunday, October 11, my 6-year-old came home from church with a craft they had made in his class, which depicted Mary and Joseph with baby Jesus -- in October!" Well, presumably you don't want the little ones making crafts of witches in church. Gerard Mitchell of London writes, "I've just been handed a sheet at work with the Christmas Lunch Menu on it, from which I pick a main course. The lunch is on December 18th, today is October 14th. Should I start planning all my meals two months in advance?" Daniel Maiorano of Howell, N.J., reports, "Last night a commercial for the 10 o'clock TV news touted a special on where to find the best deals on holiday buys, and showed an image of a storefront decked out in Christmas regalia. The date was October 12. Are that many people really buying up their gifts now?" Chris Cooper of Atlanta reports, "Reservations for having your kids see Santa at Phipps Plaza, the most expensive group of retailers in Atlanta, started one minute after midnight on October 7th, and according to the Atlanta Journal Constitution, were sold out by October 12th. Phipps is charging parents $15 for the privilege of their kid sitting on Santa's lap and having a picture taken, which is something that used to be a free." Ho ho ho -- or perhaps we should say yo ho ho and a bottle of rum. Sergeant Fernando Perez III tops them all, writing from Afghanistan: "On the 14th of October, as I was heading down a dirt road to a work site here in Kandahar, a Canadian forces radio station was playing music -- the last half hour featured Christmas songs exclusively. Everything from 'Jingle Bells' to 'Rudolph' to 'Silent Night.' I think this was Canada's version of psychological warfare." Adventures in Officiating: Running back Steve Slaton of Houston lined up wide and took a hitch screen 38 yards for a touchdown, the second time this season that play has produced a touchdown for the Moo Cows. But offensive linemen Chris Myers and Kasey Studdard were 5 yards downfield when Slaton caught the pass; flags should have flown. Unified Field Theory of Creep: Connor Wagner of Pittsburgh writes, "If Barack Obama's Nobel Peace Prize is not creep, what is? The deadline for nominations was 12 days after Obama was sworn in." Don McKinney of Apex, N.C., notes, "Type 'Drudge Report' into Google and this is what you get: 'DRUDGE REPORT 2010©.' Perhaps this means we are reading news from the future!" Second Consecutive "One Time Only" Giveaway: Two months ago, TMQ supposed that if Barack Obama supports a bonus giveaway to senior citizens whenever it is announced that there will be no Social Security cost of living adjustment increase in 2010, this would be a bad sign for his presidency. Last week, it was announced there would be no COLA increase, and Obama immediately proposed a "one time only" $250 gift to senior citizens. Set aside that this same group also received a $250 bonus last winter, also characterized as "one time only." Set aside that when the very same COLA formula that now says no increase for 2010 said a 5.8 percent increase in Social Security benefits a year ago, seniors sure didn't complain then! Set aside that the 5.8 percent increase in 2009 was itself a bonus, since inflation was less than 2 percent at the time. The key point is that in 2009, consumer prices have been negative -- prices are down 1.3 percent in the past 12 months. That means senior citizen buying power has gone up: Falling prices are the same thing as rising income. Yet seniors will still receive a bonus. Of course there are needy seniors -- but everybody on Social Security will get a check, including the wealthy. 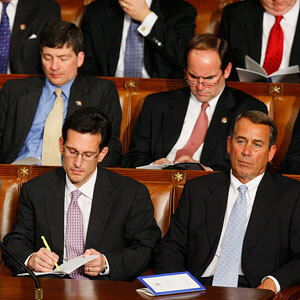 AP Photo/Charles Dharapak They're so good at giving away borrowed money, they can do it in their sleep. Obscure College Score of the Week: Rocky Mountain 52, Montana State-Northern 27. Located in Billings, Mont., Rocky Mountain College will pay the hotel bill of out-of-area prospective students who come to visit the campus. The Battlin' Bears field an NAIA football team despite a student body of just 877; earlier this season they scored 50 points, gained 623 yards, made 35 first downs, and still lost. Bonus Obscure College Score of the Week: Martin Luther 53, Crown 35. Located in Saint Bonifacious, Minn., Crown College has a president whose Twitter account says he just took a business trip to Hong Kong. Expect a tuition increase! Cupcake Update: Division I-AA Delaware State received a $550,000 fee to play at Michigan, where the Hornets were pounded 63-6 on Saturday. Check ESPN's standings for the Mid-Eastern Athletic Conference, and Delaware State is listed as 1-4. Check the MEAC's own standings and Delaware State is 1-5. Why the discrepancy? In order to accept Michigan's bag of gold, Delaware State forfeited a scheduled contest against North Carolina A&T, and the forfeit is reflected in MEAC standings. Why didn't the Wolverines offer to host North Carolina A&T? The Aggies are 3-3 -- Michigan is afraid to play them. Texas, Oklahoma Boosters Demand Their Schools Schedule Delaware State: Last week's column detailed how the "explosion of scoring" in Division I football traces to blowout wins by football factories over cupcake schools, inflating averages; when power teams face each other, scoring remains at or below historic norms. What better example than Saturday's Texas-Oklahoma game. Texas came in averaging 47.2 points per game, a figure inflated by a gimmick schedule that included a 64-7 win over UTEP; Oklahoma came in averaging 35.2 points per game, a figure inflated by a gimmick schedule that included a 64-0 win over Division I-AA Idaho State; the Texas-Oklahoma final score was 16-13. Not only is scoring not up when teams of equal caliber face each other, pass wacky is no guarantee of scoring, either. Counting sacks and scrambles, in this contest coaches called 94 passes and 56 rushes. The result was a final of 16-13. 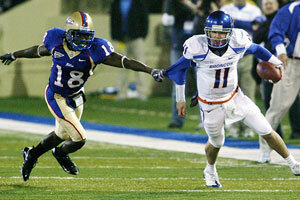 AP Photo/David Crenshaw Don't punt on fourth-and-short when close to the biggest win in program history. Buck-Buck-Brawckkkkkkk (College Edition): Many readers, including Sylvia Paterson of Bixby, Okla., noted that Tulsa -- trailing No. 5 Boise State by 28-21, within range of one of the biggest college football upsets ever -- punted on fourth-and-3 from its 39 with 4:16 remaining. Needless to say, Tulsa did not win. So what if a fourth down try failed earlier in the game, you're a mega-underdog playing on national television in front of your home crowd, you need 3 yards to sustain an upset hope, and victories don't come in the mail! Reader Comments: As the World Series approaches, Brian Morgan of Oceanside, N.Y., protests the redundancy "MLB baseball," which translates as "Major League Baseball baseball." With all the bright pink and kryptonite green on NFL players recently, I supposed a team could switch to pink and green uniforms, "the ultimate yuppies-at-Easthampton color scheme." Joe Warren of Southampton, N.Y., writes, "Perhaps you meant Easthampton, England; it's East Hampton here. I have no idea why, particularly since the nearby towns of Southampton, Bridgehampton and Westhampton Beach all use the one-word version." 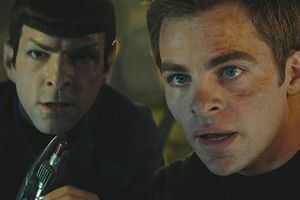 Paramount Pictures "Logically, captain, there is a 99.9 percent probability of a sequel." On leftover complaints about the recent Star Trek movie, Kevin Moralis of Whitehall, Pa., writes, "The evil Romulan commander calculated the exact point in time and space when Spock's ship would exit the black hole/convenient plot device. Previously we were told that time travel had never occurred in this Star Trek universe -- a feeble attempt to make what happens in the rest of the movies at least vaguely coherent. But if this universe had never experienced time travel, how did Nero derive the equations and understand the variables involved in something ultra-complex that no one had ever done?" Numerous readers, including Penelope Allan of Madison, Wis., noted that the evil Romulan strands Spock on what's called "a planet near Vulcan" so that he can suffer psychologically when he watches Vulcan destroyed: "The scene shows Spock staring up at a gigantic planet exploding in the sky. From Earth, other nearby planets appear as tiny dots of light. For Vulcan to appear enormous in the sky, Spock would have had to be on Vulcan's moon." Vulcan's moon has standard 1G Earthlike gravity and an oxygen atmosphere -- that's some moon! Plus the moon is totally unaffected by the planet that it orbits disappearing into a black hole. Plus Kirk is thrown off the Enterprise in an escape pod, which lands on the moon, the pod being released when Enterprise has been moving away from Vulcan at warp speed for some time. Yet the ship hasn't even passed the planet's moon. If warp speed is that slow, it would take Enterprise centuries to transit between star systems. I proposed that Red Zone Channel and Game Rewind mean "the dam is about to burst" and Sunday Ticket will be offered to everyone, not just to the lucky few who can get satellite reception. David Friedman of New York writes, "It seems the dam is already breaking in Manhattan, where satellite is rarely available." Satellite reception involves an unobstructed sightline to the zenith of the sky in the direction where the satellite hangs, which for Manhattan means an unobstructed southwest view. Tall buildings or tall trees rule out getting Sunday Ticket, or anything, via satellite. Friedman continues, "In Manhattan only, you can go online and pay $350 a year to watch Sunday Ticket via broadband, regardless of whether you subscribe to satellite." AP Photo/Steven Senne Despite snow and freezing wind, the Patriots' cheerleaders wore Halloween costumes -- small wonder New England won. Indeed, the NFL's recent deal extending the DirecTV exclusive on Sunday Ticket till 2014 -- DirecTV is wonderful, the Sunday Ticket monopoly is the problem -- said the company must begin making Sunday Ticket available via broadband to Americans whose homes or apartments cannot receive satellite transmissions. This, NFL Network president Steve Bornstein announced, would resolve the objection that Sunday Ticket marketing isn't fair to people who can't get satellite. So now Manhattan has a Sunday Ticket broadband option. Why doesn't every American have this option? It's our taxes that paid for the stadia that make NFL profits possible. There is considerable irony in the NFL demanding that NFL Network be universally available on cable, while continuing to restrict access to Sunday Ticket. To the reader thinking, "Sunday Ticket sounds nice, but I would not pay $350 even if it were universally available," bear in mind, once anyone can buy Sunday Ticket, the price might very well fall. Right now there are about 1.5 million Sunday Ticket customers. If Sunday Ticket were available to anyone at $50 annually, it would take 11 million households to result in higher total revenues at this lower cost per customer. That's a win-win outcome, and 11 million households seems a realistic goal. I offered some arguments against NASA moon and Mars planning, then suggested the agency should be spending the public's money on asteroid defense and a demonstration project to see whether space-based solar power would work. Mike Swartwout of St. Louis writes, "As an aerospace engineering professor, your NASA criticisms made uncomfortable reading for me, but they are good and necessary. There are plenty of good reasons to oppose moon or Mars missions, but space solar power makes a Mars mission look sensible by comparison. Even assuming breakthroughs in solar panel efficiency and power beaming efficiency, a space solar platform capable of powering only one small city (i.e. a few megawatts) would require building a structure several times larger than the space station, which cost $100 billion. Getting enough space solar platforms into orbit to make a noticeable dent in United States electricity consumption would require such a breathtakingly expensive commitment to building very large rockets. I teach spacecraft design to college juniors, and in one class, we went through the sizing, cost, design and risk factors for space solar and found it lacking in every category." Next Week: Ancient Mayan prophecy, revealed, says Earth will be destroyed by government deficits. Jaws: Play calling not the problem in D.C.
TMQ: How did Titans fall so fast?